Bee Docs announced a new importer that takes your OmniFocus data and turns it into a Timeline file. I love it when two great developers collaborate to make my life easier. Marketcircle's Daylite has become the “go to” applicaiton for running your law practice. This year they had a strong presence at Macworld including numerous demonstrations, presentations from the David Allen company, and previews of their soon to be released iPhone client. It supports full synching with your Daylite database. This is excellent news for Daylite users. Livescribe’s Pulse Smartpen is coming to the Mac. This is, essentially, a computer in a pen. It records all pen strokes and then recreates the pages on your screen. It also records audio while you are taking notes and indexes it to your notes. You must use their paper (printed with the required microdots to give the computer context) but I could use this every day in my practice. This could also be a nice gift for any university students in your life. The new version 10 of FileMaker took several lessons from their consumer product, Bento. It still uses the same file format so the upgrade should be relatively painless. With features and improvements such as persistent sorting, dynamic summary reports, and editable table views, it is clear this upgrade is all about the user experience. MacSpeech has now been with us a year and the software is showing its maturity through increased stability and additional features. Speaking with the developers I was most impressed with their sense of urgency. These guys are working hard to leverage the Dragon engine on your Mac. If you are practicing law without this tool, you are missing out. Give your fingers a break and check this one out. You can read my full review here. The Mac software community has exploded with task management applications. I have been running my practice out of OmniFocus now for a year and a half and consider it the best tool for the job. It allows management of tasks by both project and context, allows for easy capture of new tasks from anywhere on your Mac, and includes a robust, syncing iPhone application. Furthermore, it is fully supported by a reputable Mac developer, the Omni Group. The cost for both a desktop and iPhone license is under $100 and while there are cheaper solutions, I've not seen anything better. You can read my full review here. One of the most notable new technologies was Microvision’s laser based projector. This tiny projector (about the size of an iPhone) easily fits in your pocket and projects at 10 lumens. Because it is laser based, it focuses at any viewing distance. It looks really sharp and you can get 2 hours of projection off the battery. The unit is expected to be available this summer in the $500 price range. While Timeline 3d has been out now a few months, BeeDocs' presence at Macworld should be noted. The developer continues to refine and polish this excellent timeline application that is extremely useful in presentation work. You can read my review here. These digital white boards combine the benefits of your analogue whiteboard with the technology of your Mac. This could be useful both in the conference room and the courtroom. While a lot of people still refuse to look at iWork as a serious business tool, I continue to make other attorneys look bad using Keynote. It just about 10 years ahead of PowerPoint. The new improvements, particularly "Magic Move", will save me hours of fiddling. The increased mail merge hooks between Numbers and Pages will increase your ability to set up forms. I still must admit I do all of my serious writing in Scrivener (review here). Regardless, for me Keynote is worth the price of admission. While Apple appears to keep focusing its energies toward the Mac as a consumer device, the third party developer community continues to develop excellent resources allowing you to get the edge in your practice with your Mac. Apple announced its 2008 design awards. I was pleased to see several of them went to applications I have positively reviewed this year. In particular Screenflow and Timeline 3d. I also noted the OmniFocus iPhone application won an award. I am counting the days until I can download that one. It wasn’t so long ago that I reviewed Bee Docs’ Timeline application. In case you didn’t catch that review, it followed my general survey of OS X timeline applications and I found it the winner for the ease of use and the outstanding final product. I still use it often in my day job to great result. Timeline is the brain child of Adam Behrenger. I have to admit I love using software developed by small companies like Adam’s. As a user, I know my comments and suggestions are going directly to the guys writing the code. As a result, the software seems tighter and you can feel the sense of pride in the final product that you often don’t get with software designed by committee. As an example of this, Bee Docs has recently released Timeline 3d. The big difference with this new version is 3d presentation. A universal problem with using timelines is that you either have to dumb it down to a minimum number of events, or it gets too crowded and difficult to read. This is especially true when rendering in two dimensions. Adam came up with a way to take your timeline to 3 dimensions by virtually tilting it on your screen. Once you drop your timeline into presentation mode you can press the spacebar that essentially tilts the timeline at an angle in a perspective view. You can then see much further down the page. It all looks very impressive, like something right out of CNN. You can then manually move forward or backward down the timeline and it advances the page and three dimensionally pops out the current event of focus. These very advanced effects are stunning. Just a few years ago, this would have required some serious programming mojo. Using Timeline 3d, you just press the space bar. 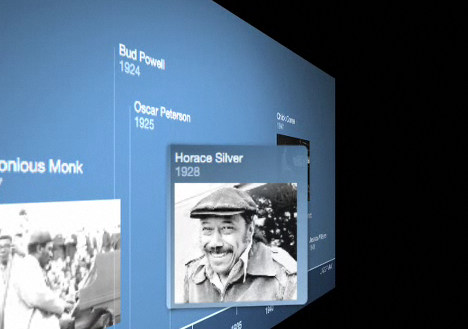 Timeline 3D also will export your timeline to Keynote. It doesn’t draw out the animations but does allow you to snap between each step in your three dimensional timeline. I haven’t had an opportunity use this in the trenches yet but I’m thinking I’ll probably just leave the timeline active in Timeline 3D and command tab to it from Keynote when necessary. I like the more fluid transition and the ability to easily go backward and forward. 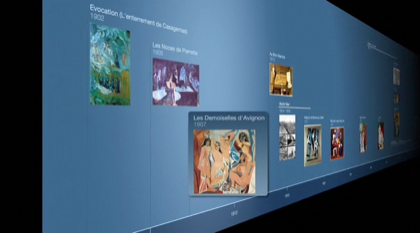 Timeline 3D can be found at beedocuments.com and is sold as a separate product from the standard Timeline application. You can download a trial and, if you have use for this sort of thing, I strongly recommend you give it a try. The standard edition costs $40 while the 3D version costs $65. There also is an excellent video at the BeeDocs website explaining how he came up with the idea for Timeline 3D on the Beedocs blog. I've already written about how much I like and enjoy BeeDocs' Timeline application. I'm pleased to see they have now released a new 3d version. I've just started playing with it but expect a full review and (possibly) screencast in the near future. In the meantime, go download the trial and give it a spin yourself. Thanks to reader Max who pointed out BeeDocs' excellent Timeline application (you can read my review right here) is on MacZot today only for $25. Now is your chance. BeeDocs released an update to Timeline now putting it at version 2.01. The update includes some Leopard updates and adds high resolution printing. You can download it here. Don't forget the "MACSPARKY" code still gets you 15% off through January. This week I’m reviewing a timeline program. Now I know right now a lot of people are rolling their eyes but I love timelines. I actually get excited about them. I think I like timelines because they are visual and a lot of times you see relationships and ideas on a timeline that don’t jump out at you any other way. Until recently I always made timelines using brute force and even on occasion (Dare I say it?) graph paper and a pencil! This changed when a reader and friend turned me onto an excellent application for OS X called, Timeline published by Bee Docs. 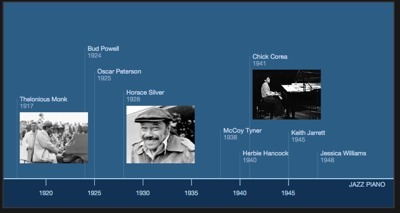 Timeline is a simple little application that does nothing but make quick, jaw-dropping timelines. My review is of version 2.0 that just recently was released. When you first load up Timeline, it presents a simple interface that allows you to pick a theme (I like gradient style “Pleather” theme) and a data source which can be any one of several applications or your own custom data set. Setting up a new Timeline is that simple. Choosing the custom option allows you set up your own timeline that can cover the past 10,000 years or the past 10 minutes. Each entry is made by simply hitting the little “plus” sign and filling in your data. The data can include much more than the obligatory name and date fields. 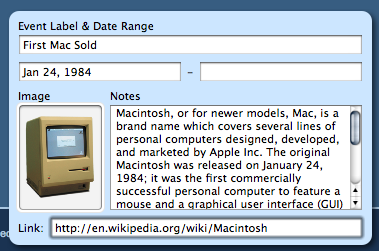 It also supports date ranges, description, photos, and links. This gives you the ability to easily create rich timelines with little work. One of my favorite parts of this is how the program makes room for every entry. Before Timeline, I always found it tedious when I decided to add an event to a timeline and ended up having to scooch everything over to to make it fit. As an example I prepared a timeline for a client on a dispute I’m involved with where I included images of key contracts and letters throughout a transaction. It took me all of about ten minutes to prepare and looked very professional. Even more importantly, it was critical in conveying important information. Following the meeting I emailed a PDF of the timeline (accomplished with one click in Timeline) and the client and I still refer to it in our phone conversations. If you don’t want to make a custom data set, Timeline will pull its data out of your iLife applications as well as a few others. Timeline even found Skitch on my machine as a source of timeline data. Using the iLife integration I made a timeline of my most recently played iTunes songs, birthdays from my address book, and photos from iPhoto. I was able to incorporate photographs and links with almost no effort. The software developer, Adam Behringer, is a fellow Mac enthusiast with whom I’ve been trading email. Adam explained he turned software developer when Apple released OS X. He has now released version 2.0 which adds all the picture and link goodness I descried above. Adam explained the vision for Timeline has always been to create an application where the Timeline can be generated as fast as the entries are discussed and he has succeeded brilliantly. This application would be useful for more people than geeky lawyers though. I can see this being used in education, business, marketing, and anything else that requires either future planning or summarizing past events. 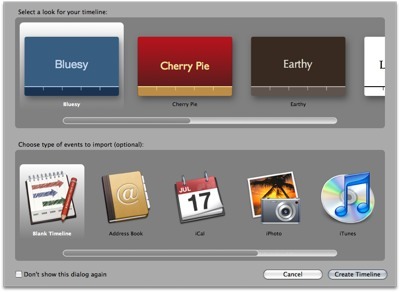 You can download a trial of Timeline at www.beedocuments.com. There is also a very nice (and short) video demonstration. A full license will cost you $40. However, the developer has generously given a discount code for MacSparky readers. If you type the code MACSPARKY at checkout, you will get 15% off. This discount is good through the end of January 2008. You can listen to the above review on The Mac ReviewCast Episode 139.